One of our favorite impromptu day trips is to southwest Michigan, following the Lake Michigan shoreline. Resort towns dot the route with beaches, small shops, galleries, and restaurants. Every time we make the trip, I get a craving for a burger from Redamak’s, an iconic mom-and-pop diner in New Buffalo. But it’s rare that we stop there. Either our meal timing is wrong, or it’s high season with a lot of people waiting outside the door. On our last trip, however, we hit it right—a weekday at 3 p.m. I don’t remember Redamak’s in its early days, when the original owners, George and Gladys Redamak, ran the business. It started in 1946 as a small tavern that served burgers and a few other items. Its location not far over the Indiana border made it a convenient stop for visitors from the Chicago area heading up to parts of Michigan farther north. It wasn’t long before Redamak’s became an institution, the place to stop. It was always busy. George Redamak passed away in the early 1970s. A few years later Jim and Angie Maroney bought the business. The Maroneys expanded the kitchen threefold and added another dining room. This was about the time that we ate at Redamak’s for the first time. I don’t know if it was the juicy hand-packed burger or the super casual, resort ambiance of the roadside diner— but I took to Redamak’s like so many others do. Unfortunately, eating there only worked out for us two or three times over the course of four decades. Every so often when we passed Redamak’s we noticed changes. The building was enlarged—and enlarged again. The gravel parking lot was paved, and people no longer parked willy-nilly. But as it grew larger, so did its number of customers. Before the parking lot was enlarged, we planned a few times to stop and wait our turn, but couldn’t find one open spot in the parking lot. So when we were heading home from Holland, Michigan, a few weeks ago, we purposely held off on lunch, knowing we’d be passing Redamak’s in mid-afternoon on a Monday. We struck it right! Redamak’s was still busy, but as large as it has grown over the years, there were plenty of available tables. 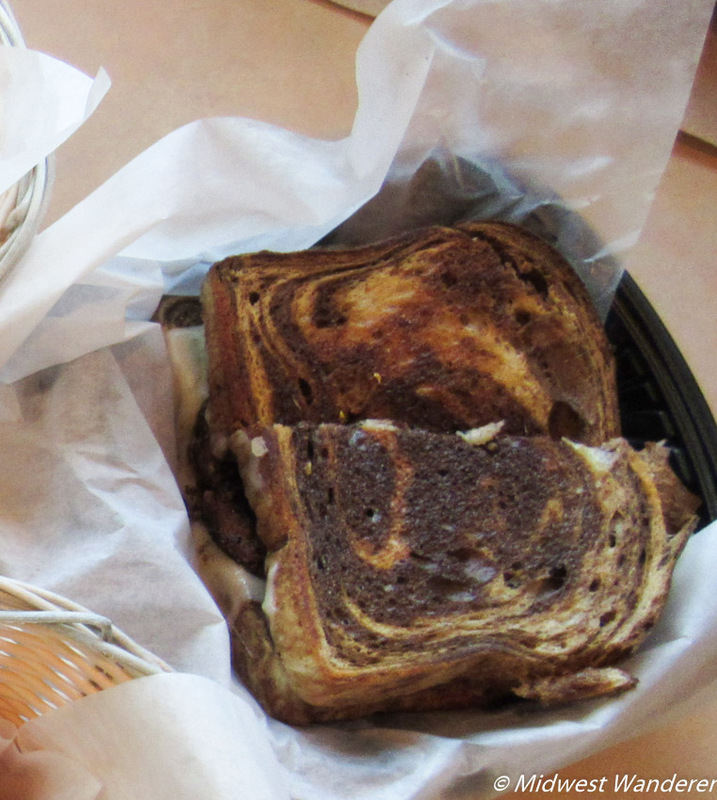 Skip ordered a patty melt, served on marble rye bread. I ordered a simple burger—the Legendary. I was pleased that they now offer lettuce and tomato on the burgers along with usual burger condiments. That wasn’t always the case. We also requested an order of regular fries and an order of sweet potato fries. What we didn’t realize is that an order is a full basket. But since we waited until 3 p.m. to eat, and it was both lunch and dinner, we ate every one of them. Was the food worth our wait getting to the restaurant? Absolutely. Some might say a burger is a burger, as long as it’s fresh, high-quality, hand-packed meat. But I think the ambiance has a lot to do with it, as well. 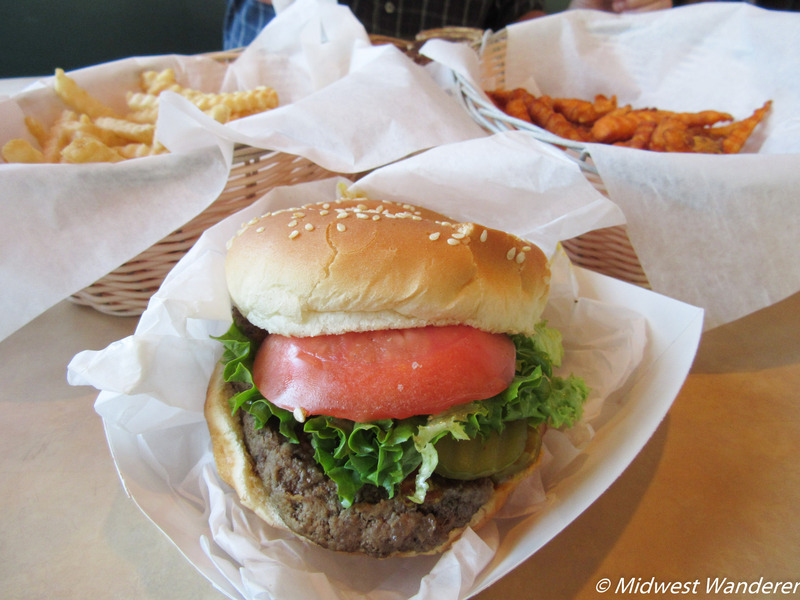 Eating a fresh burger at an iconic roadside diner adds to the enjoyment of it. NOTE: Redamak’s does not accept credit cards, so plan accordingly. If you forget and get caught short of cash, they do have an ATM in the restaurant. 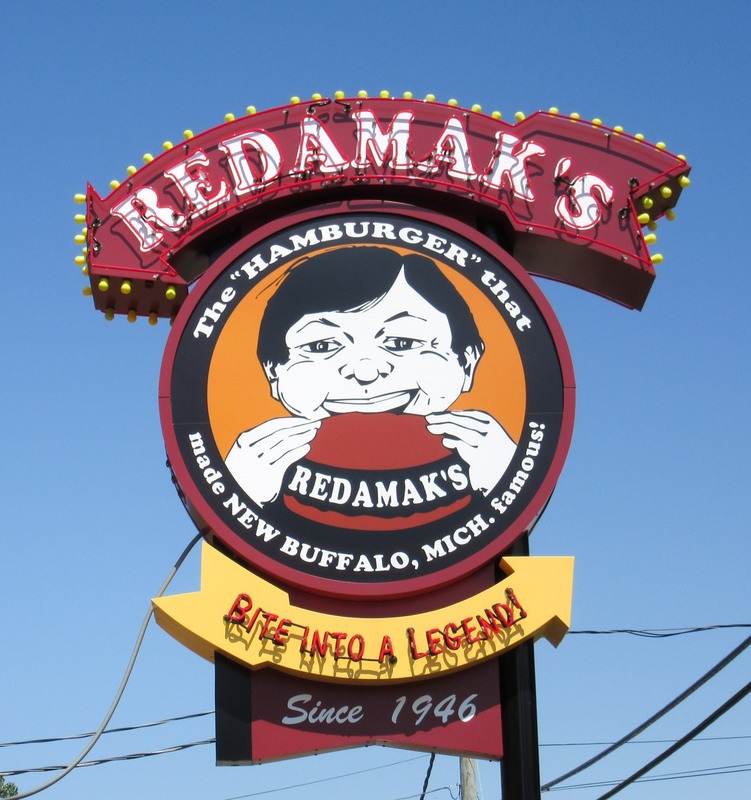 Redamak’s, located at 616 East Buffalo Street in New Buffalo, Michigan, opens for the season on March 1 and closes in October. The exact closing date fluctuates yearly. Check the website for hours and further details. Check rates for New Buffalo accommodations. 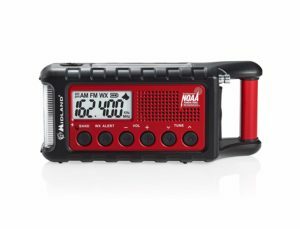 Disclosure: This article contains an affiliate link. If you book a room through the “Check rates” link above, I will receive a small commission, at no additional cost to you.